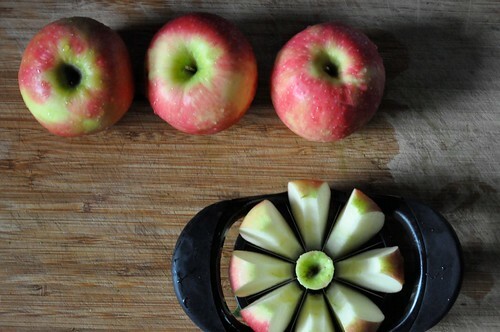 Preparing apples that will be sauteed with butter, brown sugar and rum. At a round wooden cafe table sit eleven women and two men, all past 60, all with short hair, all wearing fleece, rain pants and sensible shoes. The women talk and drink coffee. Two brought their husbands, who both order something sweet at the counter and now sit, silent, waiting because there is nothing else to do, their plates clean and their interest in each other nonexistent. Eventually the cups are drained, the catching up is accomplished and everyone moves to leave. There’s a slow deliberateness to the way they pull on jackets, adjust hats. Their nylon pants making soft sifting sounds as they shuffle out the door. Another cafe, another table of women, this time young mothers with babies tucked under their chins like bibs. They sit at a series of small tables lined up like dominoes. Their hair shines. Their faces shine. In front of each is a cupcake with a thick swirl of frosting. No one drinks coffee because they agree caffeine disrupts the babies’ sleep schedules. I wonder how they manage to glow. Perhaps because I and my small companion wander Seattle alone, I am keenly aware of people’s tribalness, the things that link them, their dress and mannerism and vocabulary. When I first moved I kept seeing the same people throughout the city, though I knew it wasn’t possible, that my eyes were seeing sameness in strangers and not the same strangers. Nine months later I still notice these small tribes as we sit in cafes, parks, the library, and as we walk down the street. Where I find similarities, my companion insists on differences because I am his mother and am bigger and have brown eyes, while he is a boy with blue eyes who likes to rest his tired feet on stray couches and tell strangers we encounter that he is two, although, in actuality, he is three. Love this. Do you belong to a tribe? I often ask myself this question. * and the mothers-who-knit-while-attending-soccer-practice tribe. Love this bit of anthropology. Me, I'm a member of the nearly invisible but still trying to be relevant tribe. We drink a lot of coffee, spend too much time in our cars. Interesting thought. What tribe do I belong to? Thanks for the opportunity to reflect.